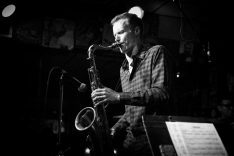 American jazz tenor saxophonist and Grammy Award-winning member of Snarky Puppy, Bob Reynolds announces Spring UK tour that sees him perform live in Manchester, Leeds, Cardiff and Glasgow with his band. Widely known for his work with both Snarky Puppy and John Mayer, Bob Reynolds is a prolific composer and recording artist with eight top-selling solo albums to his credit. The New York Times called him “a self-assured saxophonist and an unassuming yet effective composer.” An independent recording artist, Bob’s albums showcase his melodic improvisational style, tuneful songwriting, and, as the LA Times put it: “hip-swiveling” grooves. Bob’s 2013 album ‘Somewhere In Between’, a seamless blend of jazz, blues, rock and pop, reached #1 on iTunes’ jazz charts. In 2017 he released the albums Guitar Band and Hindsight and released Quartet in 2018.